Glazed earthenware, white body with gray flecks, thick-walled. 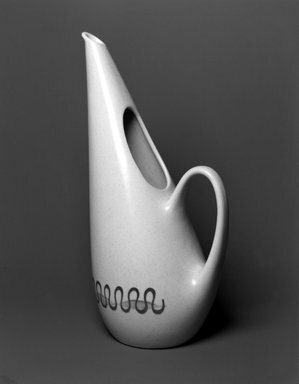 Organic, ovoid body rises into long, attenuated neck with narrow diagonally cut spout. Oval opening cut above mid-point with molded, C-shaped handle below. Horizontal band of transfer-printed decoration around lower body consisting of dark gray ribbon pattern superimposed on light gray band of elongated oval shapes. Condition: Very good; some loss of pigment in ribbon decoration on outside of pitcher opposite handle.